The idea for these cookies woke me up out of a dead sleep early the other morning. I occasionally have cooking dreams, but too often they involve food items that do not (and indeed, should not) exist. 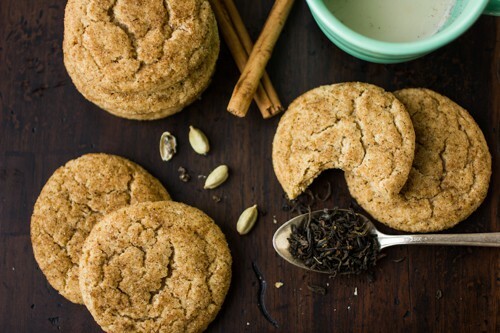 But that morning, I dreamed I was grinding up black tea in my coffee grinder with a cinnamon stick and cardamom seeds, which I then used to make spiced sugar to coat snickerdoodles. I promptly* got out of bed, went to the kitchen, and made my dream come true. *after going back to sleep until 10am, then making tea, breakfast, and checking email and food blogs for an hour. Well, I had to do something while I softened the butter, right? 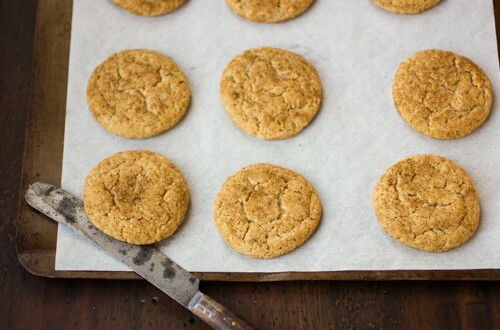 Traditional snickerdoodles are soft, chewy drop cookies rolled in cinnamon sugar. I always want them spicier, so this time I bit the cookie, as it were, and added some of the spice mixture (to which I also added ginger – I hope my subconscious doesn’t mind) right into the dough. I’m sure this is poor doodle etiquette, but it finally achieved the fully spiced flavor I was looking for. These bake up with crisp edges and chewy middles, and they stay moist for a good few days after being baked. The flavor of the spices continues to become more pronounced, though not overbearing, as the cookies sit. Organic cane sugar’s larger crystals lend a nice crunch to the crackly exterior. 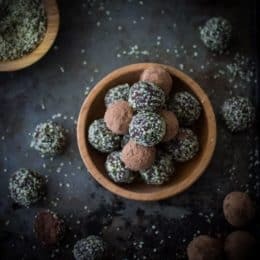 The cookies are just sweet enough to my taste, with less sugar than the original recipe, and bitter tea and spice to temper the sweetness. And you can totally eat them for breakfast because they have tea in them, right? 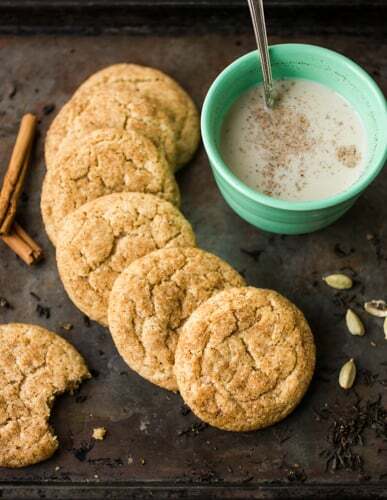 A bonus to making these cookies is that extra spiced tea sugar can be simmered in warm milk to make a sort of instant masala chai, which happens to accompany warm cookies just right. I may even make more of the spiced sugar for this very purpose. (It might be safer than baking more cookies.) And I bet the spice mixture would be a fabulous way to season granola, or ice cream, or rice pudding. I hope you find these cookies as dreamy as I do! But if you fear being prevented from dreaming (or sleeping) from the caffeine, use decaffeinated black tea. This recipe makes a rather small batch of cookies, as far as batches of cookies go; feel free to double it if you’re feeding a crowd. 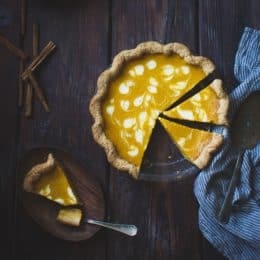 Note that if you use wheat flour (whole wheat pastry or all-purpose) in place of the spelt, you’ll want to either use the weight measurement or reduce the amount by a tablespoon or two since spelt flour is lighter than wheat flour and absorbs moisture differently. To get the seeds out of the green cardamom pods, crush the pods lightly, then pry them open and pull out the seeds. 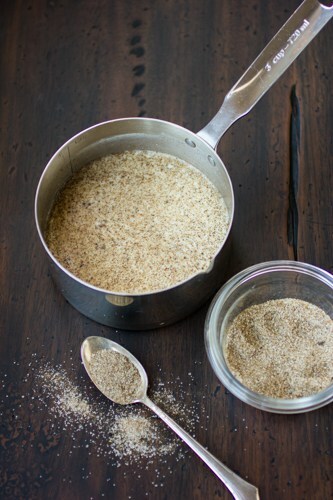 Extra spiced sugar can be simmered with milk for a tasty drink. Put 1 1/2 teaspoons of spiced sugar and 1 cup of milk (and a tiny splash of vanilla extract if you like) in a small saucepan. Heat gently, swirling occasionally, until the milk is steamy-hot. 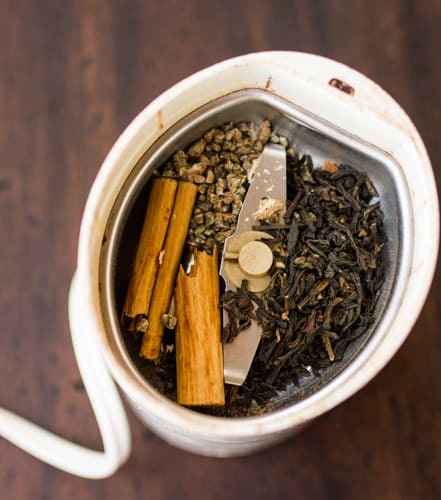 Turn off the heat and let sit for 5 minutes to infuse, then pour into a mug and enjoy. All ounce measurements here are by weight. 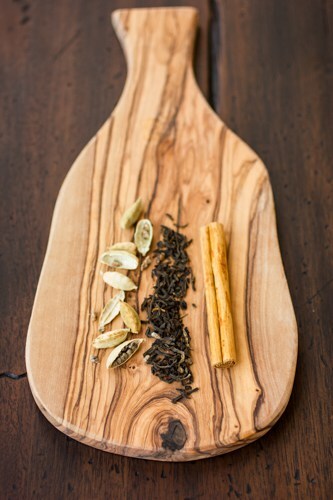 Combine the tea, cardamom seeds, cinnamon stick and ground ginger in a spice grinder (or clean coffee grinder) and grind very finely. 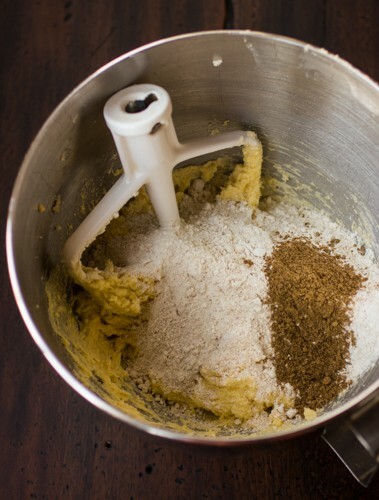 Set aside 2 teaspoons of the spice mixture to add to the dough along with the flours. 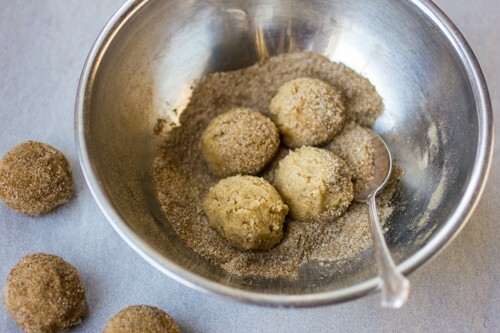 Combine the remaining ground spices with the 3 tablespoons of sugar in a shallow bowl, and set aside. Position racks in the upper and lower thirds of the oven and preheat to 350º. Line two rimless cookie sheets with parchment paper. In the bowl of a stand mixer fitted with the paddle, (or in a bowl with a wooden spoon) cream the butter and sugar until lightened and fluffy, 3 minutes. Beat in the egg, then the vanilla, scraping down the bowl and paddle as necessary. 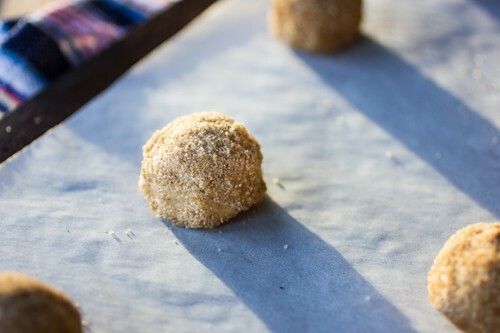 Drop 1″ balls of dough (I like to use the #40 purple-handled spring-loaded ice cream scoop) into the sugar three or four at a time and roll to coat. Place the balls on the parchment-lined baking sheets, spacing them 2 – 3″ apart. Bake the cookies for about 10 minutes, rotating front to back and top to bottom halfway through, until the edges are set, but the centers are still soft. The cookies will be puffed and cracked, the dough through the cracks will look wet, and the bottoms should be golden. Cool the cookies for a few minutes on the baking sheets, then remove them to a cooling rack. The doodles will stay moist for a solid three days in an airtight container at room temperature. Delicious cookies! 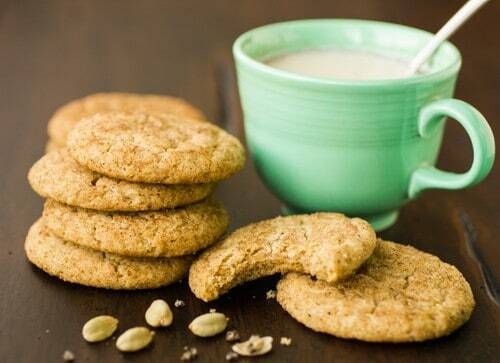 I love a good cup of masala chai tea, and these cookies would be perfect! Delicious! 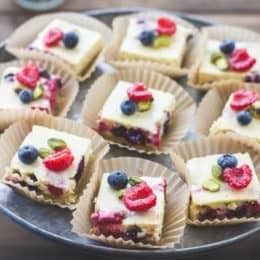 Your recipe just popped up on Foodgawker. Simply brilliant idea! 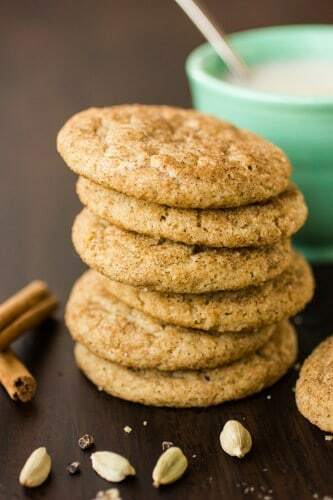 Snickerdoodles are my hands down favorite cookie and to date my recipe for Maple Snickerdoodles my Go To Cookie. Now I can't wait to get some spelt flour and give this a go. Thanks! Maple doodles sound amazing! Thanks for the kind words, and happy baking.